I think the problem with a lot of the anger we find in the rhetoric on either side of any coin these days is the inability for a person to think and rationalize with nuance. It's all centered around what does this mean to me, what do I believe without anyone stopping to think, what does it mean to others? Why do people feel differently than me? We need to step outside of our bubble, our comfort zone for just a minute and look at the big picture. I am not going to be a hypocrite and claim I have always had the ability to do this myself, it isn't the case. 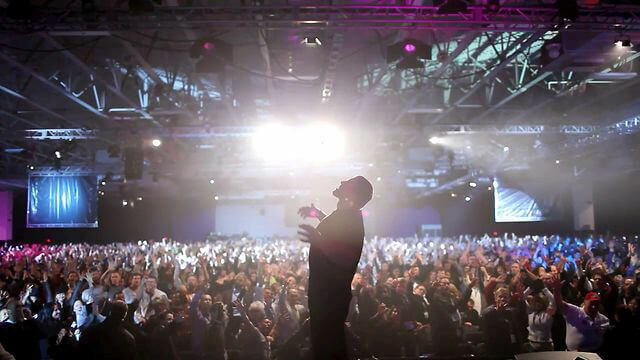 Just a few years ago I would have taken one glance at a seminar hosted by Tony Robbins and written off anyone who would spend the significant amount of money to be a part of it as crazy. As it starts the attendees rise to their feet. They dance and they cheer and some shed tears instantly, and I would have walked the other way and quickly. I would have judged them all. As I sat and watched the new Netflix documentary Tony Robbins: I am Not Your Guru, I pushed all of that aside and I truly took in the experience. I still judged, but not so much the attendees but rather Tony himself because I couldn't help but wonder about his motivations, whether they are truly born of decency and kindness or manufactured as an act, a gimmick for fame and wealth. I found myself empathizing those that threw down the cash to try and have their lives changed by this one man and his seemingly powerful words. I was moved to tears by a beautiful young woman in the crowd who was willing to admit to a room full of strangers that she was suicidal because of a tremendously dark and heartbreaking past, a life she was born into that promoted the sexual abuse of a child as a way of connecting with God. I stopped looking at these people as strange and started to see the world through their eyes, at least as much as I possibly could since I could never fully understand their pain. Of course these words would mean something to a soul so vulnerable, so desperate for answers when no one else would take the time to listen to their cries. The old me would have rolled my eyes at Tony Robbins and his pseudo-therapeutic "performance". The new me at least connected with how important he was and likely continues to be for many others. What I can judge, however, are the merits of the documentary itself and this actually proved to be quite difficult. Directed by Joe Berlinger, a man who is likely not a household name in most places but is in mine thanks to his Paradise Lost series regarding the wrongful convictions of the West Memphis Three, took on the challenge of filming Tony Robbins during a huge event in California, allowing the world to see behind the curtain of what makes Robbins such a draw, and on that level the film is a success. As I said before, I now understand why so many people would pay so much for short term salvation, and I say short term because that brings up another problem I have with Robbins himself. I feel like his brand devalues the importance of seeking actual regular therapy from a professional, because anyone who believes pain that deeply ingrained in someone for months, years, even decades can be wiped away after 4 days of dancing and words is simply flat wrong. Perhaps this is an unfair criticism for me to make because maybe his team of employees do go deeper behind the scenes, connecting the patrons with recommended places they can go to continue treatment, but if he truly holds their head and says some inspiring things only to turn away from them, it would be tragic. Where the film fails is in the way it portrays Robbins, and how Berlinger feels about him personally may have played a role since I have read he is a fan. There is absolutely no attempt to dig deeper into his character beyond softball questions and reflection upon the rough upbringing Robbins faced at the hands of his mother, which is inspiring and important, yet to accept it as the one and only thing that drives him without even a sniff of trying to question his reasoning for charging such desperate people a price of $5000 each seems misguided. I'm not oblivious to the fact that putting on such an event with entertaining production values, a full crew and whatever other expenses can add up, but I would love to hear to what extent greed plays a role in his drive to help people. The one woman I mentioned earlier apparently sold all of her belongings to pay for the opportunity to have Tony Robbins motivate her. I can't be the only person of which that doesn't sit right. Tony Robbins: I Am Not Your Guru is a tough nut to crack because it fails as a documentary but completely succeeds as entertainment. If it were on cable in the future, I would probably sit through it again just to take in the way those that believe in his message look at him, like he walks on water and will truly change their lives for the better. It's fascinating, but knowing Berlinger is capable of such comprehensive and nuanced non-fiction work and yet he essentially crafted an infomercial is disappointing.